I had my first experience eating at La Pasadita this past weekend, and it was so overwhelmingly positive that I felt compelled to register for an LTHForum account so that I could add to the sizable body of glowing reviews this establishment has already garnered on this site. Friday, July 17: I made my first pilgrimage to the sit-down La Pasadita on the West side of Ashland (I'm a sucker for free tortilla chips). Armed with a voracious appetite and perhaps a twinge of masochistic desire, I decided that I would start off at La Pasadita with a bang. With a dining companion in tow to act as a witness, I ordered an Ultimate Burrito with Carne Asada, determined to eat the whole thing. (A critical side note: I found a number of references to the Ultimate Burrito on various websites and forums, but none of these descriptions provided anything approaching an accurate appraisal of its true size. I assure you, this thing is huge: I would put its weight at somewhere between 2.5-3 pounds, conservatively). But after my first few bites, I realized that La Pasadita's Ultimate Burrito was more than a mere novelty. In fact, I can unequivocally say that it was the most delicious burrito I had ever tasted: size notwithstanding, the subtle balance of flavors was outstanding, the delicate interplay of textures and tastes divine. 30 minutes later (hey, I'm a college student!) the burrito was gone, and I spent the rest of the afternoon in a blissful food coma. July 19: Though I could not possibly stomach the thought of consuming two Ultimate Burritos in the course of one weekend, the siren call of La Pasadita's much-lauded carne asada was too strong to resist. And so it was that I cajoled my aforementioned dining partner into visiting La Pasadita once again (it wasn't too difficult: he agreed that his carne asada Super Burrito was the finest taqueria bite he had ever enjoyed). Having proved my eating abilities/abject stupidity a mere two days earlier, I decided to simply enjoy (rather than stuff) myself. We split a barbacoa Super Burrito and, in the name of apparent "authenticity," a carne asada Regular Burrito. The barbacoa was a real treat: just fatty enough, its rich meaty taste cut by the smooth guacamole. But the Regular Burrito was a revelation. It is rare that a food experience vastly exceeds its own sizable hype, but La Pasadita's "meat vessel" was pretty extraordinary. As the poster's dining companion, I can attest to both the quality of the clulinary experience and his gluttonous approach to consumption of the burritos. If you reside in the neighborhood then you are no doubt aware of LaPasadita. If you reside elsewhere in Chi Town, the establishments(s) is only a city block walk from the CTA station. Enjoy! This might be a separate topic, but has there ever been a first-time poster who is completely negative about a restaurant? Happens all the time, though they tend not to come back, so you don't notice as much. To the OP, welcome. Great first post! JeffB wrote: To the OP, welcome. Great first post! I've never had the Ultimate Burrito...I'm intrigued now. As I recall, it was called a "Super Burrito" and only available in the south most location on the west Ashland side. The other two stores didn't offer anything other than the meat, cilantro & onion version only. I agree, its an awesome burrito! Imho, Las Asadas Burritos are much better, if that's your thing. Regular Burrito: choice of meat, served with onion and cilantro. Super Burrito: choice of meat, served with cheese, sour cream, lettuce, tomatoes, guacamole, onion, cilantro and rice. Ultimate Burrito: a Super Burrito, x2 (Truly not an exaggeration. Given the sheer magnitude of the Ultimate Burrito, I was forced to cut it in half to make the entire experience a little more manageable. Each portion of my bisected burrito was indeed as large as one Super). For the sake of photographic evidence, I will try to post a picture of the burrito in question later today. I have to agree with Foodsnob77, La Pasadita's excellent burrito is only surpassed in flavor by that of Las Asadas. i've got to try pasadita and palapita. i've had asadas many, many times (mostly on lee st. never the western location though) and they can be off sometimes, lately its been about 40% off (i've gone everyday consecutively for the past week... i'm on some protein crave or something). i want to see how palapita and pasadita compare. great first write up by the way. are you @ uic? i love the university village area. there is so much good food there! regards! though i haven't had a "super" burrito, much less an "ultimate" burrito in sometime (ever? ), i may just have to get one (onion, cheese, cilantro) because of your post, thanks! MBK wrote: i've had asadas many, many times (mostly on lee st. never the western location though) and they can be off sometimes, lately its been about 40% off (i've gone everyday consecutively for the past week... i'm on some protein crave or something). This might be the most telling, descriptive statement about Las Asadas I have ever read. Sure, it may have been an inadvertent endorsement, but if Las Asadas is OFF 40% of the time, yet you've still gone there "everyday consecutively for the past week," speaks volumes to me. It might not be what you meant to convey, but this is how I feel about Las Asadas. Even on an off day, they are FAR better than most. "Off" at Las Asadas is a relative term. I did try La Pasadita (west) one time coming home at 2 am and grabbed a sack of tacos. the meat was rubbery from the dreaded 'Bucket-o-Grease'. Far from fresh charred. But I do know that timing is everything at a lot of places and it is high on my list for a 'prime time' return visit. ... that I have tried a few times. First time I did manage to finish it all but subsequent visits I fell short. ... which I always think of a French/Mexican fusion. MBK: each of your Las Asada slams, leaves me scratching my head and wondering just why do you seem to go so damn often?? If you hate it so much...dont go, everyday! I was at the Lee street location just this week around 3 PM, steak was fresh, and hot off the grill and excellent as always. I also had La Pasdita just last month at midnight, again, fresh and hot off the grill. My only complaint was I forgot to tell them no sour cream!! My fault. Somethings off, and it ain't my timing. Hey Panther: how does Ino's prepare the meat? Is it fried on a griddle or char grilled over a flame? The answer is a deal breaker for me. Thanks for the feedback guys - I will be sure to give Las Asadas a try as soon as I can. MBK: It's probably a good thing that I don't go to UIC - I could only imagine the horrible consequences that would befall me if I made this burrito a regular part of my diet. Now here's the real question for everyone out there: though judging a burrito's quality is entirely subjective, does anyone know of a place that serves a burrito larger than the one offered up by La Pasadita? abf005 wrote: Hey Panther: how does Ino's prepare the meat? Is it fried on a griddle or char grilled over a flame? The answer is a deal breaker for me. The deal is broken. TRUST me. I've been going to Inos Tacos forever and a day. I remember whern they were in Forest Park across Harlem. I still go there every once in a while. I LOVE their chicken. LOVE it. Top 3 in the area imo. The steak is probably worse than El Famous if you ask me. If you are looking for char grilled steak, stay far, far away. They employ the whole "10 lb mound of steak and onions on the griddle for 30 minutes, and into the bucket it goes" method. A: The chicken is really good. I truly, truly, like Ino's for chicken. I've had them plugged into my cell phone for about 5 years. We order from them about once per month. If I call and order a chicken "bear" burrito with no beans, and a veggie burrito, they will know it's for me. I will recommend their chicken, guacamole, and pico de gallo to anyone, but their steak is seriously vile, imo. I'm not saying that I have a better palate than anyone, it's just my opinion that their steak is among the worst I have ever encountered. And, it's VERY consistent. Aside from the steak, Panther is all kinds of correct. Those Ino's specials are a thing of beauty. In my youth, I used to get those things on the regular after a night of drinking and...well, we'll just say drinking and leave it at that. The leftovers are perfect for a breakfast at noon when you wake up. Pasadita's Ultimate Burrito is too much for me. Because of its size, it is more of a novelty item than anything else. REB and I shared one once and regretted it. Perhaps good for a small group get-together or something. It's also got rice, and veggies, and cheese, and lots of other crap that I don't really want in a burrito. I'm more of a purist, I guess. Just meat, cilantro, onion, and maybe a schmear of beans or guacamole please. I like La Pasadita, but I love the under-appreciated Carniceria Guanajuato. REB and I have served Guanajuato carne asada and carnitas to guests as a taco bar, and have enjoyed countless tacos and burritos "para aqui." Guanajuato is best during their busy lunch rush, where you'll get hot, charred carne, fresh off the grill every time, simply seasoned with lemon juice and adobo type spice blend. I can't even say how many times I've driven past a line of 50+ people at Hot Doug's with a snicker and a belly full of Guanajuato. I may be alone here, but I'll put Guanajuato up against Pasadita and Las Asadas any day. Give it a try if you haven't had it. jbertold wrote: Now here's the real question for everyone out there: though judging a burrito's quality is entirely subjective, does anyone know of a place that serves a burrito larger than the one offered up by La Pasadita? Splitting hairs, but Ino's makes one. It very well might be bigger. They do the whole two giant tortillas joined together as well, and call it the "Ino's Special." IMO, the La P steak will be far FAR better than Ino's, but Ino's chicken will be a good amount better than La P.
like i've always stated about these two locations, for me, as a proximity restaurant that serves generous portions of skirt steak, its good, but for travelers, as a destination, i don't get it. sorry, but its just how i've always viewed this restaurant. you're telling me! Mario's, Al's, Greektown, Pasadita, Chinatown ... its in perfect proximity to a lot of great eats! Carniceria Guanajuato & Palapita are now on my short list!! Bigger?? 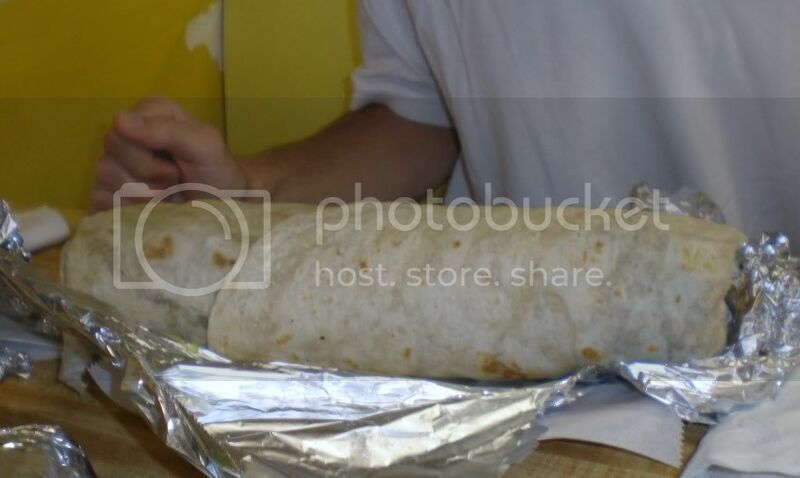 Why on earth would you want a bigger than a two 18" tortilla burrito? La Bamba claims to make "Burritos as big as your head" but they are very average gridded meat burritos, as far as I know, its on a pizza size tortilla. I think that the balance of meat to "everything else" starts to get lost after the standard burrito, and you no longer get a good integration of the contained ingredients. In other words; when every bite or mouthful is of only one ingredient, you have lost the complexity and taste of what a burrito is really all about. No one ingredient should over dominate, biting into the perfect burrito should as though there were 10 piece taste orchestra playing in perfect harmony to your pallet. What are you comparing these two locations to? I dont know whether to be jealous or what!! abf005 wrote: Carniceria Guanajuato & Palapita are now on my short list!! Therein lies the beauty of the Ultimate Burrito - it's really not a novelty item. Having sampled both the Super and the Ultimate, I can say that the ratio of meat:other ingredients remained consistent (read: borderline perfect) despite the size increase. I understand that not everyone is looking for a Mission style burrito (and frankly, after trying La Pasadita's Regular burrito, I can understand why), but for those who are La Pasadita serves up a sterling example in two sizes. I really think the steak and its juices should dominate and the other parts are supporting cast members. They should simply enhance the fact that the steak is the lead role. IMO, things like cheese, and beans dull the flavor of the steak, whereas cilantro, onion, salsa, and some creamy avocado let the steak shine through. Seriously, my mouth is watering right now thinking of Las Asadas. We all need to do a burrito night crawl together! Where we taste & photo the 4 main places mentioned here; Las Asadas, La Pasadita, Guanajuato & Palapita. We can go home and digest like boa's for days after! abf005 wrote: We all need to do a burrito night crawl together! Where we taste & photo the 4 main places mentioned here; Las Asadas, La Pasadita, Guanajuato & Palapita. We can go home and digest like boa's for days after! I'm in! Have had all but Palapita, but there is nothing like an A/B test. (Or in this case, an A/B/C/D test.) We can take a good knife with us and share each contender. I guess I should put up another contender, while we are at it. I've had great burritos at Taqueria El Asadero on Montrose. Another char-grill place. The interesting thing here though, is they don't even throw the steak on the grill until you order it. An excellent carne asada burrito, but at about half the size and a buck or two more than Guanajuato, not my go-to. I'm feeling the love all around! So lets talk dates. Do we need to move it over to the LTH calendar or should we do this via PM? 5 it is! We Need to get the hours for each. For example, I know Las Asadas closes at 8 PM, while La Pasadta has very late hours and could be the last visit on the crawl.